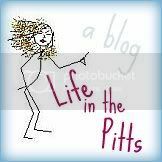 Life in the Pitts: ...I haven't washed my jeans in a while. I'm pretty sure that we are soul mates. I'm the total opposite. Jeans are a four day max for me. And that's if I'm in a rush and the washing machine is occupied with more important things like underwear. However . . . . have you watched Whitney at all? They had an episode about this very subject and it was mind blowingly hilarious. haha. do you watch that show Whitney? the dude was all about this in the last episode. so funny. Exactly! You don't even notice the splotches and fingerprints after they've been there a day or so. Besides, little touches of funk give the jeans character. Lol!! Glad to hear I'm not the only one. Ha! Anyway, like Lindsey said...the "grunge" look is in right now!! I dont know im one of those crazy fluctuators (no not that kind ;-) i was totally not into washing my jeans following your (not quiet 6 months though) but now i work in advertising and feel really bad when everyone around me looks like they have been poured into their pristine taloured jeans - oh well i guess you cant win them all right? EXACTLY! The first few days are a little maybe I shouldn't eat but then they are perfect. Until they smell bad or the hems are dirty. Then the vicious cycle starts anew.